When you need packaging, the PacMaster will help you get high-quality packaging material free of charge! The special PacMaster technique converts empty corrugated boxes into “free” large-volume filler material suitable for packing even sensitive goods for transport. The PacMaster is very simple to operate and features a lockable main switch which also acts as an emergency stop. This machine also features a rotary knob to control On/Off and reverse functions. The corrugated boxes are simply cut to the required format in the preliminary cutter. The working surface has standard size guides marked on it and along with the sliding guide, accurate cutting is guaranteed. The strips are then fed into the inlet where specially patented cutting shafts turn them into bulky packing mats. 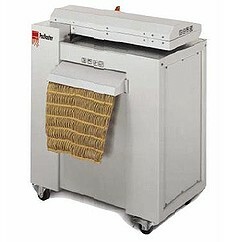 If you have any questions or are interested in purchasing the Intimus PacMaster S Cardboard Shredder, visit us at SpiralBinding.com. We have great pricing on a full line of Cardboard Converting Machines. Call us at 1-800-631-3572 for more information!